This weeks Crock Pot Raspberry Chipotle Pulled Chicken recipe makes a delicious sandwich on a pretzel roll. This is one of the easiest crock pot chicken recipes you’ll ever make. Crock Pot Raspberry Chipotle Pulled Chicken would be perfect for easy chicken sliders or you could make pulled chicken nachos. Last week I shared an awesome 3 Ingredient Crock Pot Hawaiian BBQ Rib recipe that is a 3 ingredient crock pot recipe. This weeks Crock Pot Raspberry Chipotle Pulled Chicken recipe only has 2 ingredients. You can’t find an easier crock pot recipe than one that only requires 2 ingredients now, can you? Who wants to spend the weekend in the kitchen cooking? Not me so pull out that crock pot and try one of my crock pot recipes! 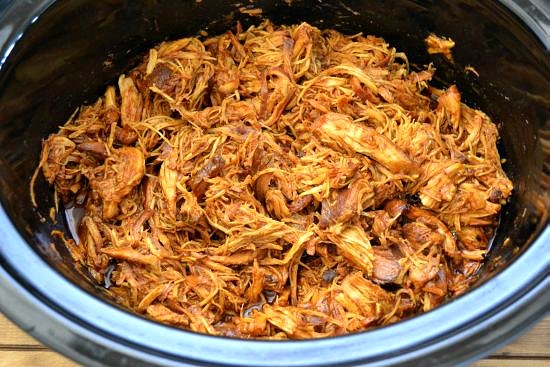 This weeks Crock Pot Raspberry Chipotle Pulled Chicken recipe is made using one of the new Sweet Baby Ray’s BBQ sauce flavors that I mentioned last week in the Crock Pot Hawaiian BBQ Ribs recipe. This newest Sweet Baby Ray’s BBQ sauce flavor is Raspberry Chipotle. It is sweet, a little spicy with just the hint of raspberry flavor. It tastes wonderful with chicken. Trim the fat from the boneless chicken breasts and place in a single layer in the bottom of an (affiliate) 6-quart crock pot. Pour BBQ sauce over the chicken and stir to cover all sides. Cook on high for 3-4 hours depending on the thickness of the chicken. Using two forks pull the chicken breast meat apart. Serve on a pretzel roll with two of your favorite side dishes. Let the crock pot do the work for you this weekend. 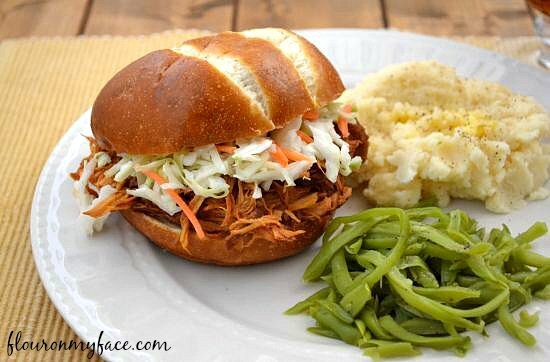 Enjoy this easy 2 ingredient Crock Pot Raspberry Chipotle Pulled Chicken Sandwich recipe on a pretzel bun. 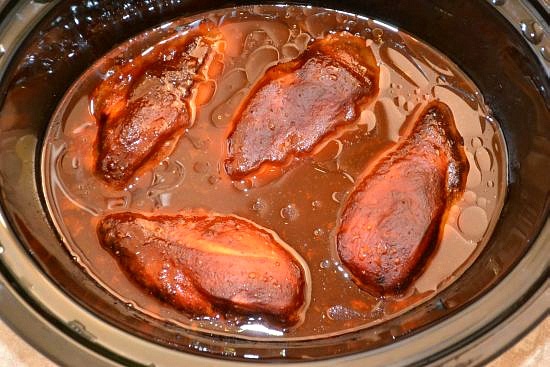 Place the boneless chicken breasts in the bottom of a 6 quart crock pot. 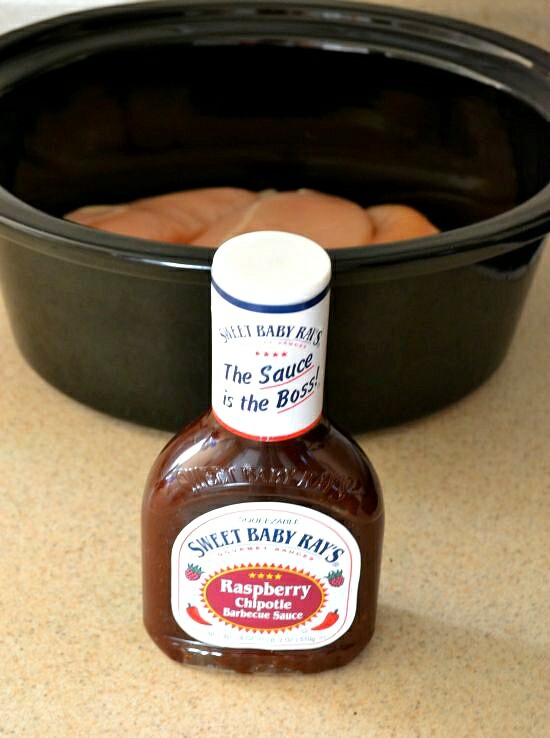 Pour the Sweet Baby Ray’s Raspberry Chipotle BBQ sauce over the chicken. Cook on high 3-4 hours depending on the thickness of the chicken. Using two forks pull the chicken apart. 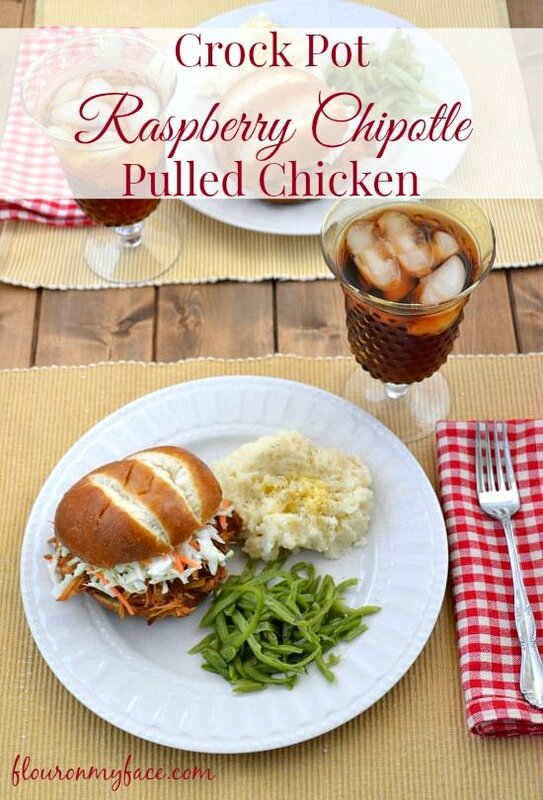 Looking for more crock pot recipes like this Crock Pot Raspberry Chipotle Pulled Chicken recipe? 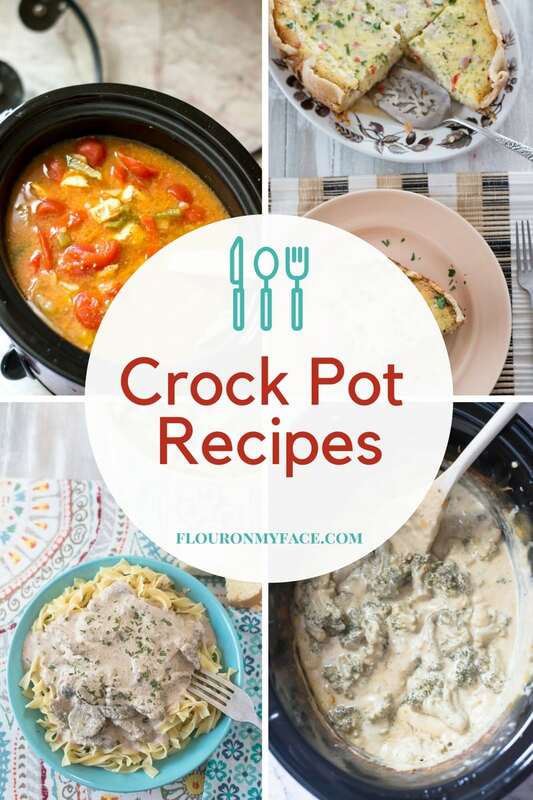 Check out my Crock Pot recipe page where you will find 200+ Crock Pot recipes. 8 hours dried my fully coated chicken out internally. 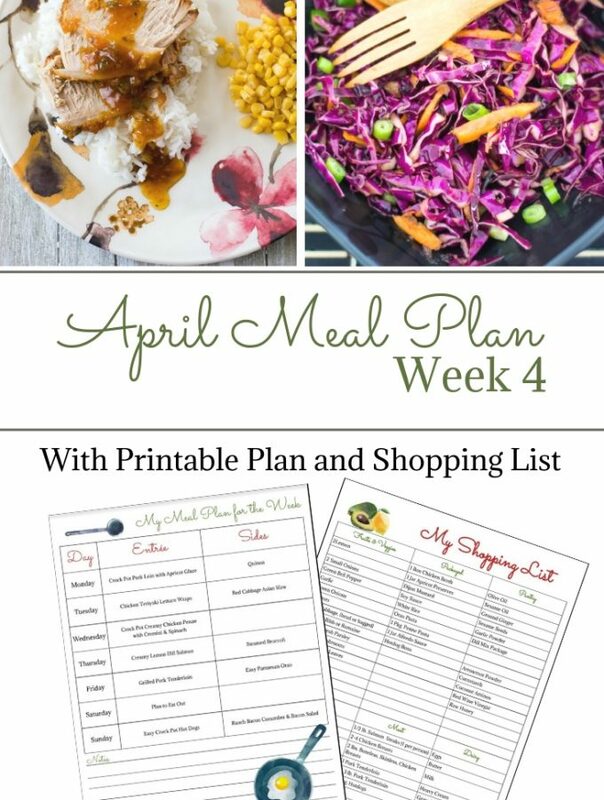 I would cut the cook time… luckily I’m not picyk as this is for meal prep for the week but serving to guest I would have been emberassed. Sorry to hear that. Cooking times are just a guideline. Size of the breasts should be taken into consideration. Also, the size of the crock pot used plays a part that why you will see that I sometimes mention the size crock pot I have used in a recipe.